Background: Elderly people often suffer from sleep disorders. Chamomile due to the many health benefits such as sedation may be effective in improving sleep quality in elderly people. This study aimed to determine the effect of Matricaria chamomilla extract on sleep quality in elderly people admitted to nursing homes of Isfahan in 2014. Materials and Methods: The present study is a quasi-experimental clinical trial. The study population was 77 cases of elderly hospitalized in nursing homes. Participants were selected through random continuous sampling and divided into intervention and control groups. The intervention group received 400 mg oral capsules of chamomile twice daily, after lunch and after dinner for 4 weeks. The control group did not receive the intervention. Sleep quality in older adults before and after intervention were compared using the Pittsburgh Sleep Quality Index questionnaire. Data were analyzed using descriptive statistics and paired t- and independent t-tests, one-way analysis of variance and liner regression analysis, using SPSS software version 17. Results: Before intervention, the mean score of sleep quality both experimental and control groups showed no significant difference (P > 0.05). After intervention, the mean score of sleep quality was a significant difference between experimental and control groups (P < 0.001). Conclusions: Oral administration of chamomile extract has sedative properties in sleep quality of hospitalized elderly patients in nursing homes. Therefore, it can be used in similar cases and nursing care. Sleep is one of the most basic human needs and any disruption in its natural course, in addition to mental health problems, also reduces individual performance. Clutter structure of sleep as acute even within 1 week; expose people to the risk of cardiovascular system diseases, especially hypertension, endocrine disorders particularly diabetes, and immune system disorders. Abnormal sleep continuation as chronic in people leads to cognitive-behavioral disorders, social performance reduction, and increased possibility of events. Sleep quality is a concept in clinical affairs and researches related to sleep. This concept refers to the sleep experience condition. Sleep quality index includes feeling regeneracy and not feeling sleepy after waking up. Sleep quality reduction may be due to the disruption of regular status and the response threshold of sleep or result of repeated insomnia. Causes lowering the sleep quality include internal factors such as pain, illness, drugs, stress, old age, obesity, and psychological changes associated with it, and external factors such as noise, light, temperature, and nursing care. Researches have shown that with increasing age, the prevalence of insomnia also enhances, since changes related to age resulting in lighter sleep and reducing the ability to sleep. Studies indicate that only 12% of aged people do not complaint of sleep problems, and more than 57% of aged people report their sleep problems. Furthermore, statistics has shown that sleep with poor quality is in the third order of aged people problems after a headache and digestion disorders and is one of the common complaints and reasons for aged people reference to doctor. Not enough sleep includes consequences such as fatigue, frustration, cognitive disorders, poor physical function, and increased mortality and as aged people consider these disorders to their age, do not seek treatment. There are various ways to deal with sleep disorders. However, aged people use soporific drugs to deal with these disorders so that 39% of soporific drugs are used by people more than 60 years old. However, these drugs temporarily reduce sleep disorders, and most of them reduce sleep with fast eye movements, which are essential for mind performance and stress relief. Furthermore, some reports are provided about dependence and drug tolerance in long-term consumptions of some soporific drugs. Hence, that sometimes privation syndrome caused by stopping the consumption of these drugs are even more than early symptoms. Other methods are used for sleep disorders treatments. Statistics shows that despite recent advances in chemistry and pharmacy, during recent decades in many countries the use of alternative therapies, especially herbal therapy is increasing even without consulting a doctor. Thus, in the last decades, a return to herbal and natural drugs is more emphasized, and a new approach has been started based on studying herbal drugs and examining their effects. One of the plants, which are used in traditional medicine as sleep aid and sedative is Matricaria chamomilla. Chamomile is used traditionally in different parts of Iran because of having antipyretic effects, strengthen the nervous and immune systems, hypnotic, sedative, and analgesic effects. Today, chamomile use is confirmed in a cough caused by bronchitis, fevers, and colds, inflammation of the skin, mouth and throat, susceptibility to infection and helps to heal wounds and burns in clinical trials, and no side effect is mentioned for its consumption. Thus, according to sleep problems in the elderly people, and the effects of chamomile it is possible that its extract to be effective in sleep quality of elderly people. In this way, this study tries to examine the effect of chamomile extract on the sleep quality of elderly people in selected nursing homes in Isfahan. This study is a quasi-experimental and clinical trial research that was conducted through pretest and posttest in control and intervention groups in 2014. The study population consisted of age people (people 60 years or older) living in selected nursing homes of Isfahan. For this purpose, using the preliminary sample of 10 patients, mean score and standard deviation of sleep quality in elderly population was calculated 213 and 9.7, respectively. Then, using the formula “to determine the sample size to compare two independent groups,” with a confidence level of 95% and an error of 0/05, the required sample for study was determined, 70 people. However, due to the possibility of sample loss, 80 people were selected with easy sampling (available). Inclusion criteria were as follows: (1) To participate in the study and give informed consent to do so. (2) Age of 60 years and more. (3) Mental health and not suffering from any of the specified diseases of the liver, kidney, asthma, cancer, and mental to ensure the health status of participants from the health records of patients was used that was mentioned by center doctor (nursing home). (4) Residing in one of the nursing homes studied. (5) Capability to answer the questions of the questionnaire. (6) Lack of any sensitivity to chamomile or its compounds that were determined by the medical center. (7) Lack of consistent use (twice or more per week) of tea or chamomile extract during the last 6 months. (8) The ability of oral use of chamomile capsule. (9) Not suffering from diseases related to sleep as obstructive apnea or a restless leg that was determined by physician of the center. (10) Lack of dependence or addiction to any drug, antidepressants, hypnotic, and alcohol. (11) Not using heparin, warfarin, and aspirin (due to drug interactions with chamomile extract). Furthermore, having any of the following conditions, leads to the aged people exit from the group: (1) Stopping the consumption of chamomile extract for any reason before completing the intervention period. (2) Chamomile extracts consumption by the patient against the administered dose. (3) Developing any disease during the study period, that resulted to the prohibition of chamomile by the patient. (4) Showing any allergic reaction to chamomile during research that was examined and determined by the physician of the center (during the study, none of the samples did not suffer from chamomile sensitivity). (5) Unwillingness to cooperate during the investigation. (6) Exit from the study due to the reasons such as death, illness, or transferred to other centers. This study was conducted as a clinical trial in control and test groups by randomly dividing into two groups. The required sample size was completed from seven selected nursing home. Sampling nursing homes were all private sectors that were introduced by welfare center of Isfahan province. Eighty participants entered the study, by drawing method 40 people were in test group, and 40 people were in control group. In a way that numbers 1–7 (each characterized by a nursing home) were written on cards and placed into a corpuscle. The first output card was included in test group, and the next was included in control group and in this way, a nursing home was included completely in control group or test group. Therefore, control and test groups were held in separate facilities and were not in contact with each other. At the end of intervention, 77 participants including 37 subjects in the intervention group and 40 in control group were successful to finish the research course. Two people due to leaving the nursing home and one person due to death were excluded in this study. In this study, in addition to the personal data, the Pittsburgh Sleep Quality Index (PSQI) was used. The questionnaire included personal data such as age, gender, education level, marital status, presence or absence of chronic disease in people, hypnotic drugs consumption, and patient inhabitancy duration in nursing home. PSQI is a self-report questionnaire which investigates sleep quality during 1st month and includes 19 questions about 7 aspects of sleep quality including subjective quality of sleep, delay in sleeping, sleep duration, beneficial sleep, sleep disorders, hypnotic drugs consumption, and daily performance disorder due to the sleep deficiency. The questionnaire score is considered between 0 and 21. The total score is divided into four statuses of good, fairly good, fairly bad, and bad. Nine main questions from the main body of the questionnaire. Questions 1–4 are open, short answer, and single answer and questions 5–9 are based in Likert scale. In the process of completing the questionnaire, the researchers explained about the purpose of the study and questionnaire complement method to statistical society. Scores 0, 1, 2, and 3 in each scale, respectively indicate a natural status, the existence of a mild, moderate, and severe problem. Questionnaire total score of 5 or more represents inappropriate sleep quality and the higher the score, the lower the quality of sleep. Validity and reliability of this tool have been reported in Iran by researchers. First, in Iran, this questionnaire has been translated to Farsi and then was translated to English again to approve it. According to studies conducted, Cronbach's alpha coefficient was calculated 78/0–82.0 in Farsi questionnaire. Furthermore, Hosseinabadi et al. and Soleimany et al. have announced questionnaire reliability 88/0 and 84/0, respectively through test-retest. In this study, chamomile dry extract was used as oral capsules for test group. The dose and duration of use with pharmacist consultation, based on similar studies were considered 400 mg, 2 times a day after lunch and after dinner for 4 weeks., Chamomile extract was injected to oral capsule gelatins and was provided on a weekly basis to nursing homes. This drug was given to patients based on checklist and by written marks. No intervention was conducted about the control group. After obtaining ethical permission from Islamic Azad university of Isfahan (Khorasgan), University of Medical Sciences and the Welfare Organization of Isfahan, referring to nursing homes under the supervision of Welfare Organization, research plan, its objectives, possible side effects, and symptoms for elderly people in respective centers and related authorities were fully explained, and volunteers were taken informed consent to participate in research in written form. Moreover, cultural values and respect to aged people rights were taken into account. Possible damages were predicted. Aged people were explained that their participation in research is completely voluntary and anytime they want and they can exclude from the research. Their information remains confidential by researcher, and their name will not mention. Regarding possible risks and side effects of chamomile consumption, all available scientific resources were investigated. In none of the studied resources, complications were not reported in connection with chamomile. Therapeutic dose was considered based on scientific resources and related researches (400 mg twice a day after lunch and dinner for 4 weeks). Furthermore, physician and pharmacist were available during this project, to prevent drug interactions and possible side effects of chamomile extract. Consultant physician monitored all stages of intervention (intervention tolerance by aged people, any side effect check for any allergic to chamomile and criteria to enter research which needs to be approved by a doctor, such as not suffering from mental illnesses). Honesty and integrity were taken into consideration in all stages of research. The questionnaire was completed by the researcher interviewing patients. Since most of the participants in the study were illiterate, low educated or had vision problems, and also due to aging, understanding some of the concepts and questions was difficult for them; it was tried to ask questions in a simple way, and if there was ambiguity in their response, researcher has been asked more explain for clarification, and have been completed the questionnaire. Furthermore, personal information of patients was collected before intervention, using patients' health records. Collecting sleep quality data were performed before intervention and for the 2nd time within 4 weeks after the intervention, using PSQI for two groups. To describe research results and indicating the frequency of each variable, information summary method in descriptive (frequency table, mean, mode, standard deviation, and calculating the percentage) and inferential statistics was used. To investigate studied variables of normal distribution Kolmogorov–Smirnov test was used and to investigate homogeneity of control and test groups in terms of demographic characteristics, the independent statistical Chi-square test, and t-test was used. To compare the mean difference of sleep quality scores in control and test group before and after intervention independent t-test statistical methods and paired t-tests were used. 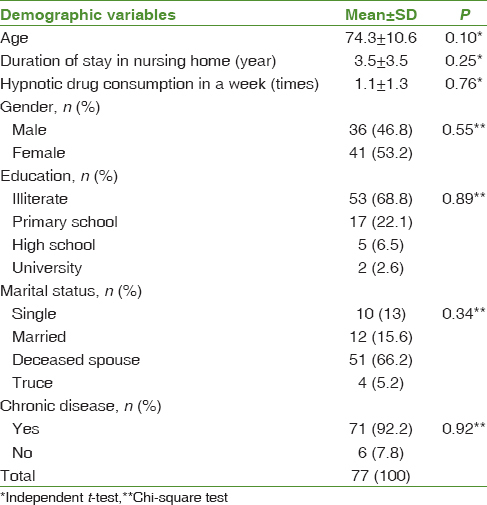 Furthermore, to evaluate the relationship between sleep quality with age, gender, education level, marital status, the length of stay in nursing homes, chronic disease, and times of hypnotic drugs consumption during the month one-way variance tests simple linear regression analysis, and independent t-test were used. In all tests, the level of significance was set at 0.05. To calculate and analyze statistical information, version 17 of SPSS (Chicago, IL, USA) software was used. In this study, about 77 people (including 37 patients in the control group and 40 in the intervention group) who were collected in 2014 in 7 nursing homes of Isfahan were analyzed. Data were collected immediately before the intervention and 4 weeks after, it was completed (intervention was 2 times a day for 4 weeks). [Table 1] indicates demographic characteristics and homogeneity comparison of aged people in control and test groups. The results of Kolmogorov–Smirnov test indicated that the variables were normally distributed (P > 0.05). [Table 2] indicates the comparison of sleep quality in aged people in control and test groups before intervention. According to this table, an independent t-test showed that before intervention, there was no significant difference between the sleep quality mean in control and test groups (P = 0.488). To determine the factors associated with sleep quality in elderly people, linear regression analysis test was used. [Table 3] shows the results of regression processing to assess the relationship between research variables with sleep quality of aged people. 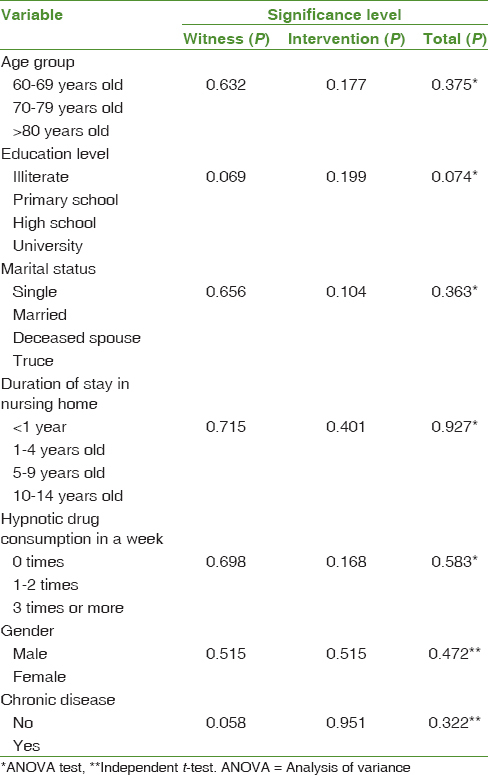 Based on the obtained results of this table, no significant relationship was observed between individual characteristics and sleep quality (P < 0.05). [Table 4] was developed to compare sleep quality between control and test groups after intervention. Furthermore, one-way variance analysis tests and independent t-test showed a significant relationship between individual characteristics and sleep quality (P < 0.05) [Table 5]. According to [Table 4], independent and statistical t-test showed that after intervention, there was a significant relationship between sleep quality mean in control and test groups (P < 0.001). On the other hand, the results of paired t-test indicated that there was no significant relationship between sleep quality mean of control group before and after intervention (P = 0.49). Moreover, the test showed that there was a significant relationship between sleep quality mean of test group before and after intervention (P < 0.001). Results of this study showed that 4 weeks consumption of chamomile extract was significantly effective in improvement of sleep quality. In this regard, the results of Zick et al. study also showed that 4 weeks consumption of chamomile extract had a medium effect to improve sleep disorder symptoms and daily performance of patients suffering from sleep disorders compared to placebo. The results of Cho et al. showed that aromatherapy with chamomile essence and lavender can reduce stress and improve sleep status in Intensive Care Unit patients. The results of these studies are consistent with the results of chamomile hypnotisms and confirm the impact of chamomile in the elderly people sleep. Since in our country prevalence of sleep disorder in aged people is remarkable and is reported as much as 40% that was excessive to about 25%, using nondrug treatments such as chamomile can be useful in reducing this disorder. In conducted studies, a significant relationship was observed between depression and anxiety with sleep quality. Amsterdam et al. in 2012 showed that chamomile extract consumption reduces symptoms of depression and anxiety in patients with generalized anxiety disorder. Furthermore, in another study of Amsterdam et al. in 2009, it was shown those chamomile has a significant effect on improvement of depression symptoms in patients and provides peace to people. The result of these studies is consistent with chamomile calming effect and improves sleep quality of aged people in this study. Based on some studies, gastrointestinal problems are in the second order of age people problem after headache. In Langhorst et al. study, it was indicated that ulcerative colitis treatment with gum, chamomile, and coffee was more effective than treatment with mesalamine medications and reduce gastrointestinal symptoms in people. In addition, Langhorst et al. in their study findings state that chamomile, in addition to effect on the digestive system, has sedative and analgesic effects. Hence, it is possible that chamomile in addition to improving the gastrointestinal symptoms of aged people be also effective in relaxation and preparation for sleep. The results of such studies are consistent with this study in having relief properties and thus, improve the sleep quality of aged people. However, the noteworthy point is that in this research there is a significant correlation between demographic variables, duration of stay in a nursing home, frequency of sleep medications consumption, and there is no significant relationship between underlying diseases with sleep quality. The reason for this may be due to small sample size, so repeating the study in communities with larger sample sizes seems necessary. Montgomery, in the form of a systematic review, showed that among nonpharmacological methods, exercise, cognitive therapy and lowering light to improve sleep quality, exercise, and lowering light have no significant effect while cognitive therapy effectively improve sleep quality. Dadashpor et al. in 2014 in examining other nonpharmacological methods showed that exercise in water improves sleep quality in aged people. In this regard, Yazdani et al. study aimed to investigate the effect of fennel and chamomile on pain of dysmenorrheal also showed that the consumption of chamomile is effective on abdominal and pelvic pain, depression, and anger. In line with this study, Jenabi and Ebrahimzadeh  study aimed to investigate the effect of chamomile tea on menstrual pain in college students showed that drinking chamomile tea is effective in relieve menstrual pain associated with primary dysmenorrhea as well as psycho-social problems caused by it and causes peace in those individuals. Moreover, the result of Modares et al. study (2012) and Karimian et al. study in 2013, aimed to compare the effectiveness of mefenamic acid and chamomile capsule on primary dysmenorrhea showed that the chamomile capsule consumption can reduce primary dysmenorrheal effectively and has relaxation properties in individuals. The results of this study are consistent with the results of chamomile extract relaxation in this study, and it can be concluded that chamomile extract leads to relaxation and consequently sleep quality improvement in patients with decreasing pain. Although many studies have been conducted relating the effects of chamomile in animal models that are not necessarily the same with human situations, but the results of these studies are still demonstrate sedative properties of chamomile. The results of Shinomiya et al. study showed that chamomile extract has benzodiazepine-like properties in rats' sleep and provide them peace. In laboratory researches, it also has been showed that in chamomile combinations there are sedative, analgesic, and anti-anxiety properties. The researchers found that chamomile contains several ligands similar to benzodiazepine and also, it was confirmed that benzodiazepines are inhibitor and relief factors. Some reports indicate that the sedative effects of chamomile relate to benzodiazepine-like components in it. The results of such studies can justify relaxation properties of chamomile and improvement of sleep quality in aged people. This study has limitations and deficiencies as well as other studies that findings must be viewed in this context. One notable limitation of this study is related to not using blinding. Another limitation is its quasi-experimental design so that the researcher was not able to control many effective factors on sleep quality of aged people such as pain, discomfort, illness, certain medications, anxiety, stress, diet, and environmental factors such as light, noise, and nursing care. Although many of these factors are attempted to be controlled. Furthermore, this study was conducted in two groups. Hence, it is suggested that to achieve more accurate results, a study implemented and designed with larger size and in three groups (considering placebo group). Another remarkable limitation is that to investigate data only questionnaire was used, and other laboratory tests were not used. The results of this study indicated that chamomile extract consumption to improve sleep quality can reduce complications related to drug measures. Thus, according to the results of this study and not reporting any side effects associated with its use due to the high prevalence of sleep disorders in aged people, chamomile extract is suggested in similar cases and nursing care. This article is adapted from a graduate thesis in nursing field medical-surgical trend approved by Islamic Azad university of Isfahan (Khorasgan), with the number of 23810403922004. In this way, it is sincerely grateful of Khorasgan Islamic Azad University, Welfare Organization, nursing homes cooperation, and all aged people who participated in codification and writing of this study. The information of this study are registered by the moral ID (code) of 492036 from the Deputy of Research and Technology of medical sciences university of Isfahan in the database of clinical trials of Iran with the number of 1N2013102015080IRCT and in the and TDs information database was registered with the number of 2168147. Isfahan (Khorasgan) Branch, Islamic Azad University. Narang I, Manlhiot C, Davies-Shaw J, Gibson D, Chahal N, Stearne K, et al. Sleep disturbance and cardiovascular risk in adolescents. CMAJ 2012;184:E913-20. Asadnia S, Sepehrianazar F, Mosarrezaii Aghdam A, Saadatmand S. Comparison of sleep quality and migraine headaches in people with proper and improper and poor sleep. Urmia Med J 2013;23:799-806. Yaremchuk K, Roehrs T. Does perioperative sleep disruption impact pain perception? Laryngoscope 2012;122:2613-4. Dijk DJ. Sensitive to sleep loss or not: Neurons, working memory, insomnia and the heart. J Sleep Res 2013;22:237-8. Saydshohadai M, Heshmat SH, Seidfatemi N, Haghani H, Mehrdad N. The spiritual health of seniors living in sanitarium and home residents. IJN 2013;26:11-20. Cooke JR, Ancoli-Israel S. Normal and abnormal sleep in the elderly. Handb Clin Neurol 2011;98:653-65. Rejeh N, Heravi-Karimooi M, Montazeri A, Foroughan M. Psychometric properties of the Iranian version of the facts on aging quiz (FAQI). Payesh 2012;11:245-51. Abbasi B, Kimiagar M, Shirazi M, Hedayati M, Sadeghniiat K, Taheri P, et al. Effect of magnesium supplementation on calorie intake and weight loss of overweight or obese insomniac elderly subjects: A double-blind randomized clinical trial. Iran J Nutr Sci Food Technol 2012;7:31-40. Kunz D, Mahlberg R. A two-part, double-blind, placebo-controlled trial of exogenous melatonin in REM sleep behaviour disorder. J Sleep Res 2010;19:591-6. Rudolph U, Knoflach F. Beyond classical benzodiazepines: Novel therapeutic potential of GABAA receptor subtypes. Nat Rev Drug Discov 2011;10:685-97. Makvandi S, Zargar Shoushtar S. Midwifery students' attitudes towards herbal medicine and its application in obstetric. Jentashapir Journal of Health Research (Jentashapir) 2012:81-6. Posadzki P, Watson LK, Alotaibi A, Ernst E. Prevalence of herbal medicine use by UK patients/consumers: A systematic review of surveys. Focus Altern Complement Ther 2013;18:19-26. Namvaran-Abbas-Abad A, Khayat-Nouri M. Interactions between Matricaria recutita and Cisplatin on PTZ-induced seizure threshold in mice. KAUMS J (FEYZ) 2011;15:188-93. Afzali SF, Shariatmadari H, Hajabbasi MA. Sodium chloride effects on seed germination, growth and ion concentration in chamomile (Matricaria chamomilla). Iran Agric Res 2010;29:107-18. Ariamanesh F, Malekshahi F, Safari M. The effect of foot massage on night sleep quality in hemodialysis patients. Quartely research journal 2015;17:71-7. Iwasaki M, Hirose T, Mita T, Sato F, Ito C, Yamamoto R, et al. Morningness – Eveningness questionnaire score correlates with glycated hemoglobin in middle-aged male workers with type 2 diabetes mellitus. J Diabetes Investig 2013;4:376-81. Ong JC, Cardé NB, Gross JJ, Manber R. A two-dimensional approach to assessing affective states in good and poor sleepers. J Sleep Res 2011;20:606-10. Khani F, Samsam Shariat S, Atashpour S. A Study of the relationship between personality traits with occupational accidents and quality of sleep among road drivers in Isfahan city (Year 1390). Secur Soc Order Strateg Stud J 2013;1:75-88. Malek M, Halvani G, Fallah H, Jafari Nodoushan R. A study of the relationship between the Pittsburgh sleep quality index and road accidents among truck drivers. Occupational Medicine quarterly journal 2011;3:14-20. Hosseinabadi R, Nowroozi K, Pooresmaile Z, Karimloo M, Madah S. The effect of massage on acupoints to sleep quality in elderly. Q J Rehabil 2008;9:8-14. Soleimany M, Nasiri Ziba F, Kermani A, Hosseini F. Comparison of sleep quality in two groups of nurses with and without rotation work shift hours. Indian J Nephrol 2007;20:29-38. Modarres M, Mirmohhamad Ali M, Oshrieh Z, Mehran A. Comparison of the effect of mefenamic acid and Matricaria camomilla capsules on primary dysmenorrhea. J Babol Univ Med Sci 2011;13:50-8. Zick SM, Wright BD, Sen A, Arnedt JT. Preliminary examination of the efficacy and safety of a standardized chamomile extract for chronic primary insomnia: A randomized placebo-controlled pilot study. BMC Complement Altern Med 2011;11:78. Sheikhi L, Karami B, Chopani J, Hokari S, Falah B. Evaluation the status of sleep quality in elderly people in Kermanshah city. J Rehabil Med 2015;3:81-8. Ahmadvand A, Sepehrmanesh Z, Ghoreishi F, Mousavi S. Prevalence of insomnia among 18 years old people and over in Kashan City, Iran in 2008. KAUMS J (FEYZ) 2010;13:313-20. Amsterdam JD, Shults J, Soeller I, Mao JJ, Rockwell K, Newberg AB. Chamomile (Matricaria recutita) may provide antidepressant activity in anxious, depressed humans: An exploratory study. Altern Ther Health Med 2012;18:44-9. Amsterdam JD, Li Y, Soeller I, Rockwell K, Mao JJ, Shults J. A randomized, double-blind, placebo-controlled trial of oral Matricaria recutita (Chamomile) extract therapy for generalized anxiety disorder. J Clin Psychopharmacol 2009;29:378-82. Moradi M, Mehrdad N, Nikpour S, Haghani H, Sharifi F. Heart failure is one of the most common cardiovascular disorders. In this disease heart is disable to perfusion. Inst J Nat Resour 2013;8:18-25. Langhorst J, Varnhagen I, Schneider SB, Albrecht U, Rueffer A, Stange R, et al. Randomised clinical trial: A herbal preparation of myrrh, chamomile and coffee charcoal compared with mesalazine in maintaining remission in ulcerative colitis – A double-blind, double-dummy study. Aliment Pharmacol Ther 2013;38:490-500. Montgomery P, Dennis J. A systematic review of non-pharmacological therapies for sleep problems in later life. Sleep Med Rev 2004;8:47-62. Dadashpor A, Mohamadi R, Dadashpor A. Investigating effect of a period of water exercise on sleep quality in male elders. J Shahid Sadoughi Univ Med Sci 2013;21:300-10. Yazdani M, Shahriari M, Hamidi B. Comparison of fennel and chamomile extract and placebo in treatment of premenstrual syndromes and dysmenorrheal. Hamdan Med J 2004;8:57-61. Jenabi E, Ebrahimzadeh S. The effect of Matricaria chamomilla tea on primary dysmenorrheal. J Med Plants 2009;8:39-42. Modares M, Besharat S, Rahimi Kian F, Besharat S, Mahmoudi M, Salehi Sourmaghi H. Effect of ginger and chamomile capsules on nausea and vomiting in pregnancy. J Gorgan Univ Med Sci 2012;14:46-51. Available from: http://www.goums.ac.ir/journal/browse.php?. [Last accessed 2017 May 22]. Karimian Z, Sadat Z, Abedzadeh M, Sarafraz N, Kafaei Atrian M, Bahrami N. Comparison the effect of mefenamic acid and Matricaria chamomilla on primary dysmenorrhea in Kashan Medical University Students. Journal of Ardabil University of Medical Sciences 2013;13(4):413-20. Shinomiya K, Inoue T, Utsu Y, Tokunaga S, Masuoka T, Ohmori A, et al. Hypnotic activities of chamomile and passiflora extracts in sleep-disturbed rats. Biol Pharm Bull 2005;28:808-10. Srivastava JK, Shankar E, Gupta S. Chamomile: A herbal medicine of the past with bright future. Mol Med Rep 2010;3:895-901.